Visiting the Shamans Gallery has been very high on my to-do list for a while and it was actually the main reason I planned a trip out to the Arizona Strip this fall. After hiking down into Tuckup Canyon I finally realized that goal when I was face to face with these amazing pictographs. 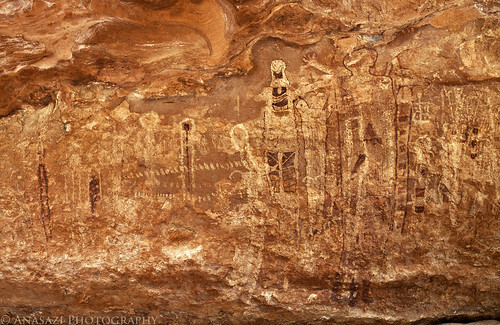 The detail and colors used here is outstanding, and these pictographs are not like anything I have seen before. The big climb back out of the canyon was worth it to visit this site. This photo does not show the complete panel, only the right side of it. I will be posting a few more photos of this panel throughout the week.